Kids love to watch funny cat videos because of all the unexpected things cats do. The internet has made celebrities of funny cats like Grumpy Cat and Lil Bub. These ten videos feature cute cats and kitties doing all sorts of entertaining things—from playing to stalking to just being adorable. Your child will fall in love with this energetic kitten! She pounces on her toy mouse over and over again. Kittens learn how to stalk their prey by playing and having fun. They are born with natural instincts for stalking and hunting. You can see in this video the young kitten is learning how to hunt and just having fun with her toy mouse. She is learning how to use her claws to get a hold of the mouse and bat it around. Cats love to play games that rely on their natural hunting instincts. This cat seems to be playing the classic game Whack-a-Mole. Her owners have cut holes in a cardboard box just large enough to stick a finger through. Their rescue cat named Orange becomes transfixed by the appearing and disappearing fingers in each hole. She taps the fingers down with her paw as they pop up in each of the holes. It’s adorable! Check out these cats discovering a new hiding spot! Two cat friends play hide and seek in a small garbage can. They contort their bodies to get in to the small space. Then they pounce out unexpectedly, like a jack in the box. Watch as they take turns hiding and exploring their new hiding place. Hilarious! This video was originally called “How Bob Gets His Exercise.” It was the category winner of The Friskies 2014 Cat Video Awards. The pudgy cat in this video puts on a show kids will love. He is such a happy cat, chasing his own tail. He can be seen jumping and spinning and just having fun. Its almost as if he is break dancing! And now for something completely different… an animated cat music video! This video features a little animated kitty that moves to a catchy song your kids will love. This cat jam is high energy excitement. Your kids will get up and dance. Its addictive fun! These two cats seem to be having a conversation between themselves. According to their owner, they usually would fight each other but in this rare moment they calmed down and talked it out. These two female cats are named Stina (on the right) and Mossy (on the left). They are not related, just friends. Listen to their friendly chatter as one seems to respond directly to the other. So cute! A lot of people have viewed this famous cat video. It is a short video but fun to watch. Check out the funny expression on this cat’s face. What is she looking at? She opens her mouth wide and tilts her head. Its fun to guess what makes her do this. Was it something she saw that scared her? Or is she saying OMG? Let your kids decide! This video is one of the most popular of all kitten videos. It is maybe the most adorable video you and your kids will see. The baby kitten is lying on her back and each time someone surprises her, she reacts with a playful, adorable reaction. Your kids will want to watch this one over and over again. Its easy to do since it is a short video. Ever wonder what happens when kittens meet puppies for the first time? This video will show you. The kittens and puppies emerge from their carriers to play and learn about each other. Watch them sniff and chase each other around. Sometimes they will lick a new friend. Later in the video they get to share a meal together. It’s cuteness to the max in this video! Your kids will be fascinated by this hilarious stalking cat. He stops and starts as he gets closer and closer to a feather. Its almost like he is playing the game Red Light/Green Light. It is so funny how he sneaks up on the feather as it is presented and hidden from his sight. Your kids will love it! Funny Cat Videos For Kids – BONUS VIDEO! This video features super high-quality video of a mother cat talking to her cute kittens. This nearly 20 minute-long video chronicles the kittens first weeks of life and shows all kinds of kitten behaviors. Kids will enjoy seeing them sleeping, playing, purring, hugging and licking. The mother cat feeds and cleans her babies. She communicates and takes care of them as only a mother could. Cats and kittens are endlessly fun to watch. These ten videos show cat behaviors from funny to cute to just plain adorable. Your kids will enjoy all the different cat activities and the many games they play. 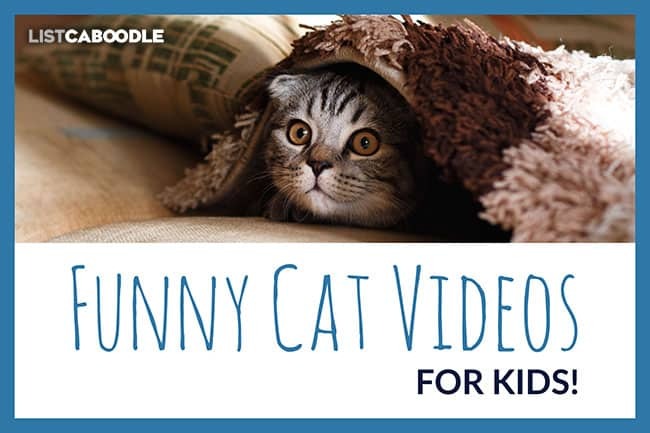 If you enjoyed these cat videos, you may also want to check out this list of Funny Dog Videos For Kids. Naming your cat? Here is a great guide to Unique Cat Names Kids Will Love. How many famous cats do you remember from TV and movies? Check out the 15 Famous TV and Movie Cats We Love.